Preheat oven to 325 degrees. Melt 2 tablespoons butter in a large braiser or high-sided ovenproof skillet over medium-high heat. Add bacon; cook until crisp. Add onion; cook until tender. Add garlic and thyme; cook for 1 minute. Add wine; cook for 1 minute. Add tomatoes; cook until sauce is thickened. Add stock and beans; bring to a simmer. Add sausages. Bake for 30 minutes. Toast breadcrumbs in remaining butter in a skillet over medium-high heat, stirring, until golden, 8 to 10 minutes. Stir in parsley. Season with coarse salt. Remove skillet from oven. Heat broiler. 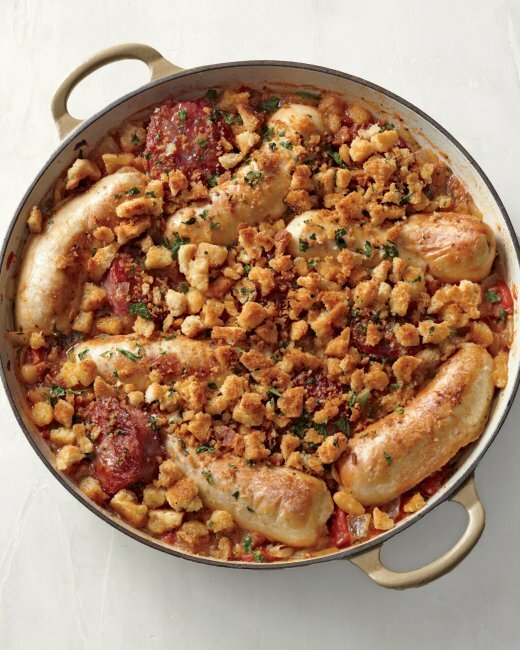 Scatter breadcrumbs over top of sausage mixture. Broil 6 inches from heat source until top is deep golden brown, 1 to 2 minutes.